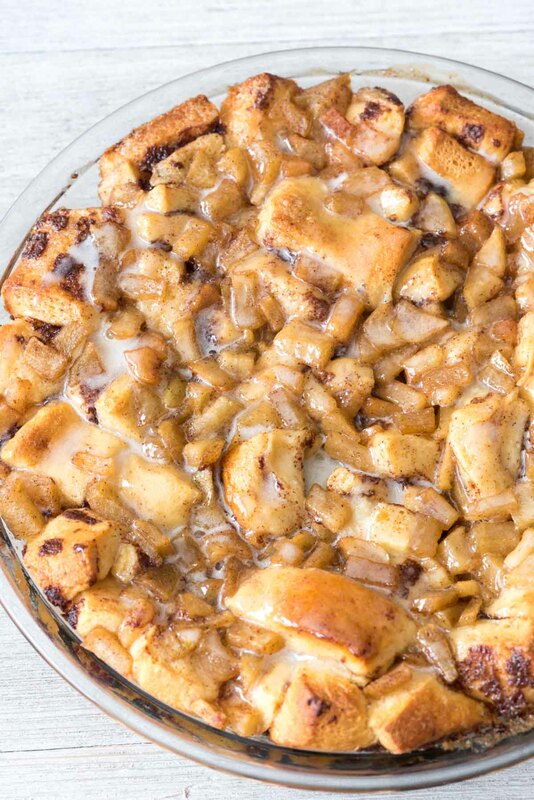 Apple Fritter Cinnamon Roll Bake is an easy apple brunch recipe that’s like a monkey bread and a bubble-up bake all in one! Cinnamon rolls and apples for breakfast for all! You know the speed and bagging abilities of each cashier on the floor at any given time and are able to navigate the line to your advantage. You plan your weekly meals according to which vegetables you know they sell there so you can avoid going to the real grocery store. You go for one item and spend $150. You have the coupon texting number in your contacts list. You realize as you’re texting “SAVE” to that number so you can save $10 off a $40 clothing purchase that you also used the same coupon the last time you were at Target, which means you’ve spent over $40 on clothing twice in less than a week. All of these may or may not have happened to me last week. I’m not confirming or denying it, and neither is Mel because I used my own credit card so he wouldn’t see two Target trips on our joint card and be all WTH are you buying at Target? …But I also really like looking at clothes. So really, going a second time was an easy choice. Have you ever made a recipe knowing that you immediately needed to get rid of it? I’m famous for those recipes and most of them get sent off or frozen ASAP. But not this one. This one I ate straight from the pan. With a fork. Over two days. BY MYSELF. This is a keeper recipe. If you make one sweet brunch or breakfast recipe this year, let it be this one. 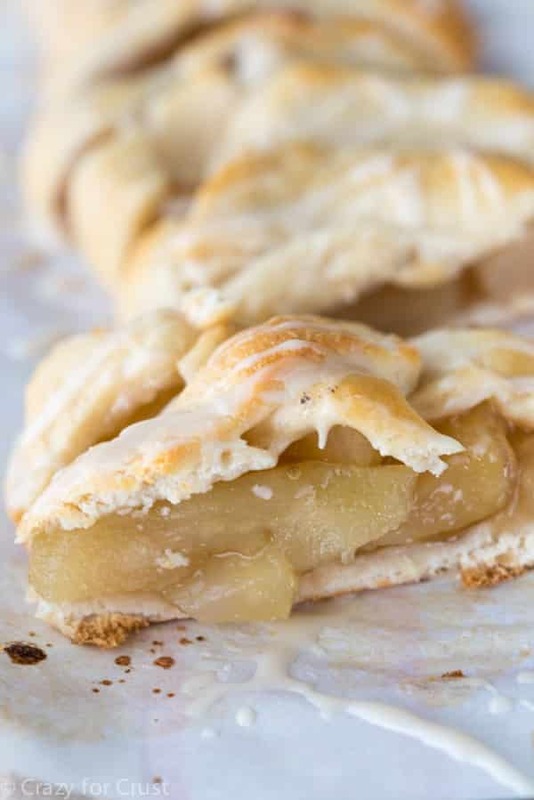 It’s easy, has just a handful of ingredients, and tastes like an apple fritter on crack. Except the crack is Pillsbury cinnamon rolls and icing. Basically, this recipe is ready in no time at all. 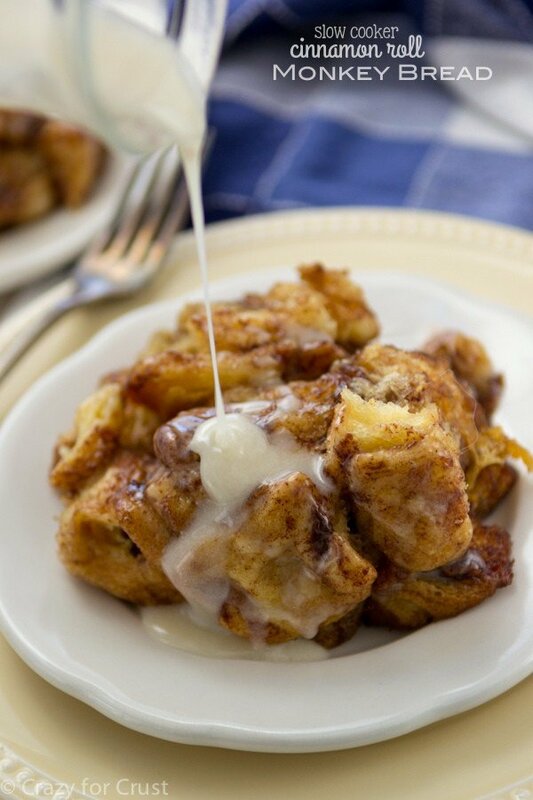 It’s like a combination of monkey bread and an apple fritter and a cinnamon roll and a bubble-up bake all in one. It starts with the aforementioned $150 Pillsbury Grands! cinnamon rolls. I cut each roll into 6 pieces (and they promptly fell apart, so that’s okay). 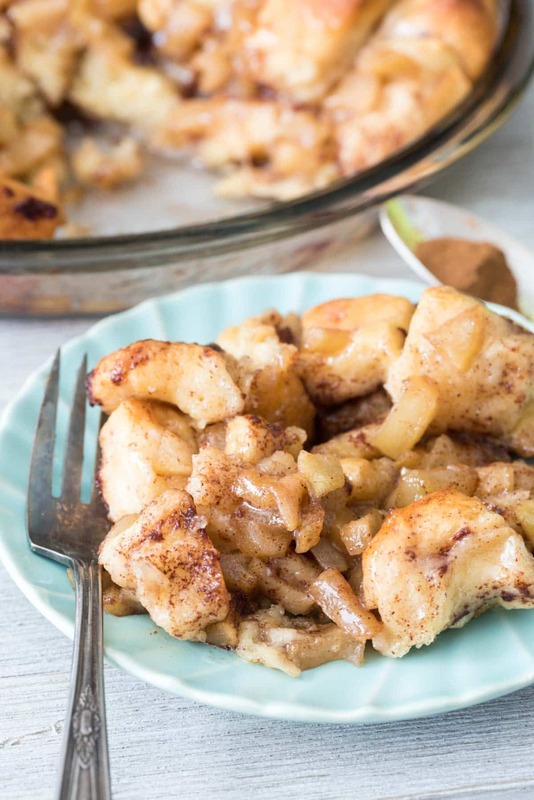 Place them in a baking dish and top them with easy cinnamon apples. I used 2 apples that I diced small and cooked in the microwave with some brown sugar and cinnamon. Then I drizzled a monkey bread glaze (brown sugar + butter) all over the top and baked them. THEN I thinned out the icing that came with the cinnamon rolls and drizzled it allllll over the top. And then I attacked the pan with a fork. 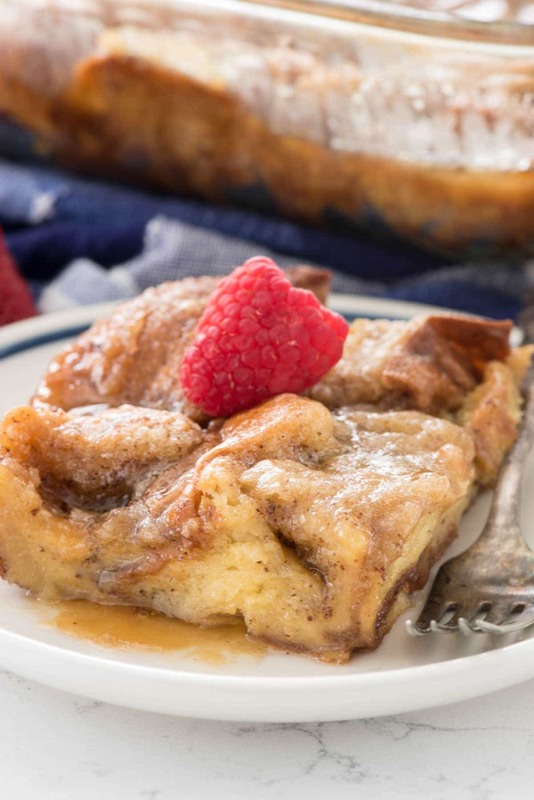 Apple Fritter Cinnamon Roll Bake is an easy apple brunch recipe that's like a monkey bread and a bubble-up bake all in one! Cinnamon rolls and apples for breakfast! Preheat oven to 350°F. Spray a 9" pie plate or pan with nonstick cooking spray. Place small diced apples, brown sugar, ground cinnamon, and 1 tablespoon of water in a small bowl. Stir. Cover loosely with plastic wrap and cook on high power for 2-3 minutes, or until apples are just slightly translucent. Drain well. 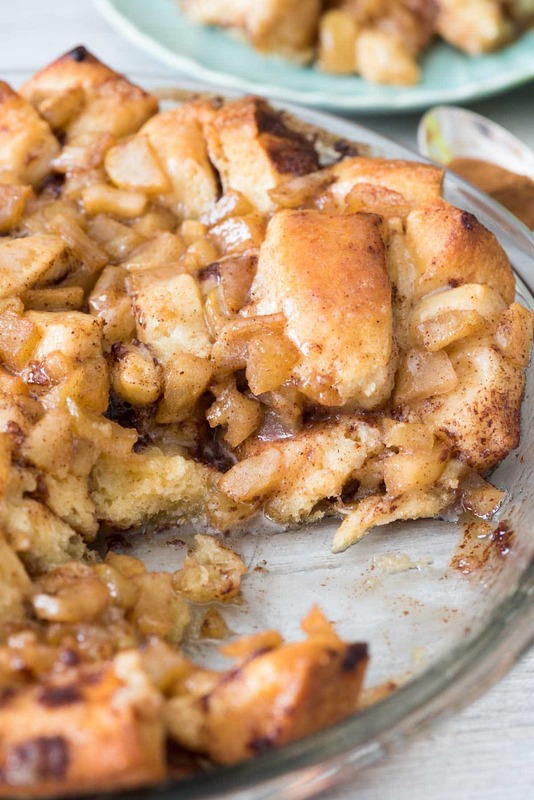 While the apples are cooking, cut each cinnamon roll into 6 pieces. They'll fall apart a little, that's okay. Sprinkle the pieces evenly in the prepared pan. Once the apples are done, drain them well and sprinkle them over the cinnamon roll pieces. Stir the melted butter and brown sugar together, then pour over the top of the apples and cinnamon rolls. Bake for 28-33 minutes or until cooked through in the center. Just before serving, place the icing that came with the cinnamon rolls in a small bowl. Heat for about 10 seconds so it's pourable. Stir in heavy whipping cream (or milk) to make it more of a glaze, then pour over the top of the casserole. Serve warm or room temperature. Store tightly covered for up to 2 days. I followed the directions. Despite a few misgivings of the process. Should have stuck to my instinct. Roll baked on top but demanded raw on the bottom. Waste of good apples and my time. I’ve made other dishes with refrigerator cinnamon rolls, so I left a “hole” in the middle to help crisp the middle where the dough can be mushy. I also put a tablespoon of bourbon instead of water when cooking apples in microwave, then instead of cream/milk I thinned the icing with amaretto.